Property Size 1,390 sq. ft. The villa is a fully outfitted two bedroom, two and a half bath villa, decorated with local art. The great room overlooks the 13th hole, the Caribbean Sea and a panoramic view. It has a deck which includes a splash pool, recliners and canopy over the dining table. Enjoy beautiful sunsets and sunrises from the comfort of the deck. The master bedroom has a king size bed with a tempurpedic mattress, for a great night’s sleep. The guest room has two twin beds and the living room couch folds out to sleep two more. 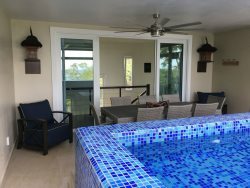 The villa has cable tv and wi-fi to stay connected and enjoy internet and cable offerings, the kitchen is fully stocked with beautiful black granite counters and stainless steel appliances and has a garage for your rental car. Pristine Bay is a gated community with 24-7 guards to ensure a safe environment. Roatan enjoys peace and serenity typical of the best of the Caribbean. We welcome you to enjoy our tropical paradise! Main Road, Next to Island Concrete, Brick Bay.